In store tinting systems are typically prone to fungal contamination on partially dried pigment dispersions in tinting cartridges. Preservation is a challenge, requiring a balance between in-can and dry film efficacy, highly susceptible formulations and regulatory restrictions. High costs are incurred when tinters become contaminated and equipment has to be cleaned and sterilised. Thor has found the perfect preservation solution with a separate addition of in-can and dry film actives, including Thor AMME™ technology. Various ACTICIDE® products for in-can and dry film are available. Determining the optimum preservative balance uses unique test methodology that replicates practical conditions more accurately than similar methodology, ensuring that choices can be made with confidence! Thor is delighted to have been honoured with this prestigious global award, presented during a ceremony at Kemira HQ in Helsinki in March 2019. Currently supplying Kemira in 15 countries, Thor was selected as the sole award recipient from a shortlist of 13, selected from 13,000 suppliers worldwide. The award is given to suppliers who have provided extended support in three main areas covering commercial contract, operational excellence and value proposals. Kemira’s stated vision is to be the first choice in chemistry for water intensive industries and works closely with its suppliers to create an environment where suppliers feel compelled to deliver value to the business and are recognised for their contribution. 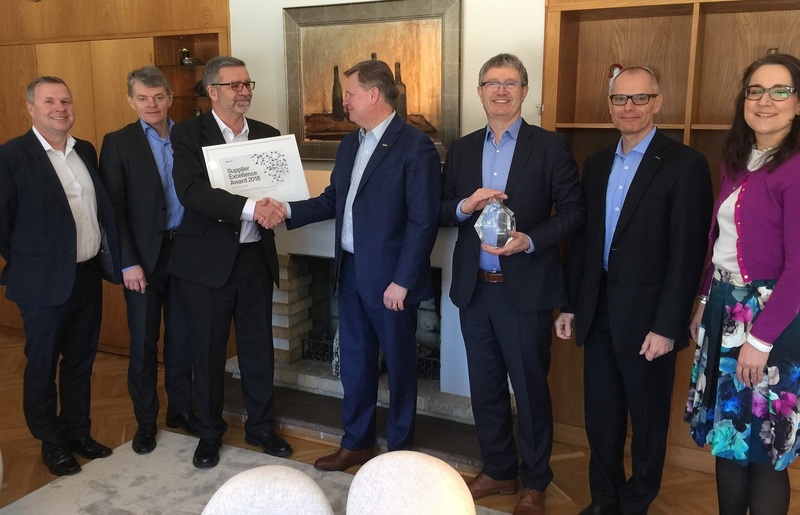 Pictured are Kemira CEO and President, Jari Rosendal, presenting the award to Thor’s Mitch Cook, Global Account Manager for Kemira, along with senior management from both companies. Well done to Mitch and the team! Thor China has recently taken part in ChinaCoat which took place this year in Guangzhou. ChinaCoat has become the major exhibition for the coating industry. Paint producers from all over China, as well as from Japan, Korea and South East Asia visited ChinaCoat to meet business partners and colleagues. 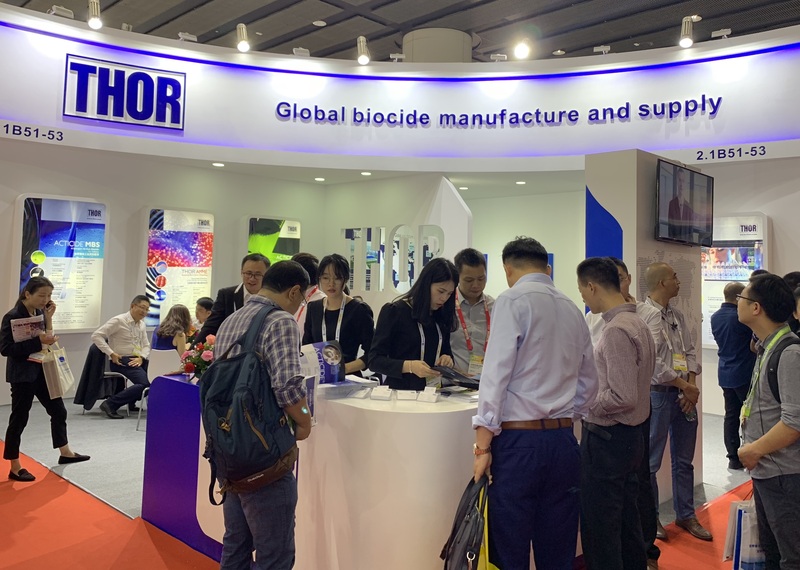 Many existing and potential customers visited the Thor booth to discuss products, applications and market trends with Thor sales and technical experts. Thor China’s Technical Manager, Roger Ling, gave a presentation to introduce Thor AMME™ technology, which received an enthusiastic response from local paint companies. We were delighted to meet so many of you at ChinaCoat 2018 and look forward to seeing you again in Shanghai next year! 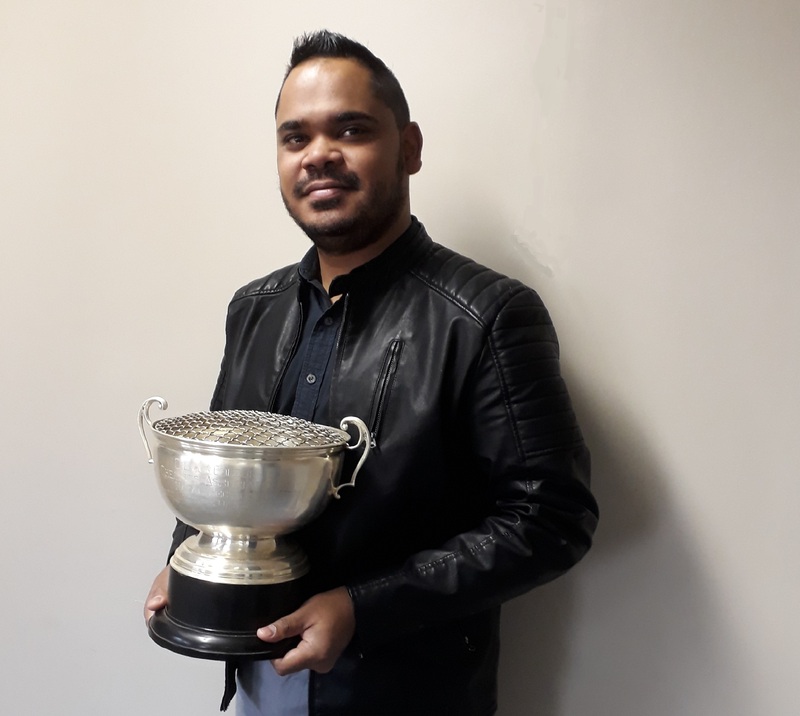 Deshyn Pillay, Technical Manager at Acti-Chem South Africa was honoured to receive the 2017 Speaker of the Year Award from the KZN section of OCCA (Oil & Colour Chemists Association) at a recent function. This floating trophy is awarded annually and Deshyn joins a number of previous Acti-Chem personnel awarded this trophy: Peter Strassburg in 1990, Rod Rees in 1998 and Dave Alexander in 2001. Deshyn’s winning paper was entitled ‘Greener Preservation Strategies’ and examined formaldehyde free, EU compliant and AMME™ biocides. 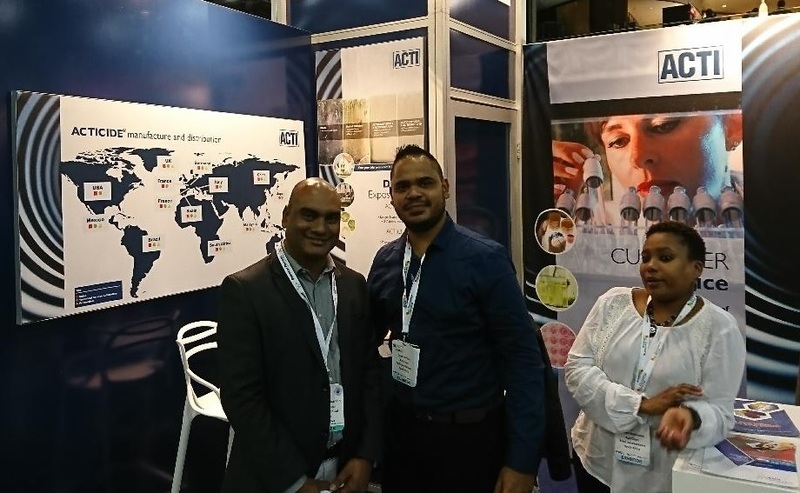 Acti-Chem, Thor’s subsidiary in South Africa, has once again exhibited at the Coatings for Africa show in Johannesburg. This year’s conference and exhibition at the end of May was one of the biggest and most well attended of recent years, reflecting an upswing in the economy and renewed interest in the continent. The Acti-Chem stand was equally busy, entertaining prospective and existing customers from all over the African continent. Significant interest was shown in innovative technologies such as Advanced Micro Matrix Embedding (AMME™) and Thor staff were on hand to offer support on a variety of technical issues. 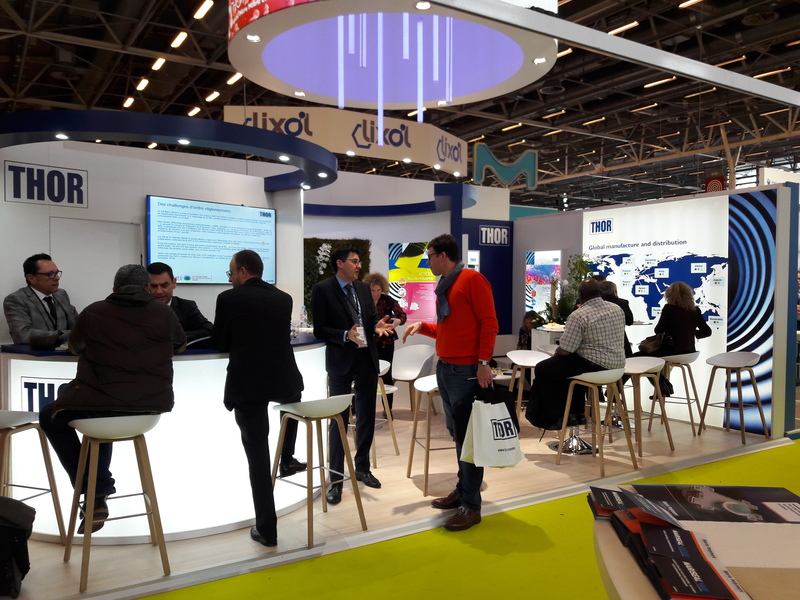 Thor France has recently exhibited at the Eurocoat 2018 exhibition in Paris which gained an impressive 5,000 visitors over the 3 days of 26 – 28 March. Thor’s attractive and innovative stand welcomed present and future customers from Europe and further afield. Staff from Thor in Salaise were on hand to discuss Thor’s wide range of in-can and dry film biocides - many of which feature Thor’s AMME (Advanced Micro Matric Embedding) novel technology enabling more effective long term film preservation with a reduced environmental and human toxicological impact. Eurocoat in Paris is proving a firm biennial favourite meeting place, particularly for French speaking coatings professionals. We look forward to meeting you all again in 2020! The Thor team in Australia was again delighted to show its support of this local community hospital in Sydney - close to the Thor Australia offices. The money will be used to buy four Connex vital signs monitors with mobile stands to enhance the facilities available at the hospital. 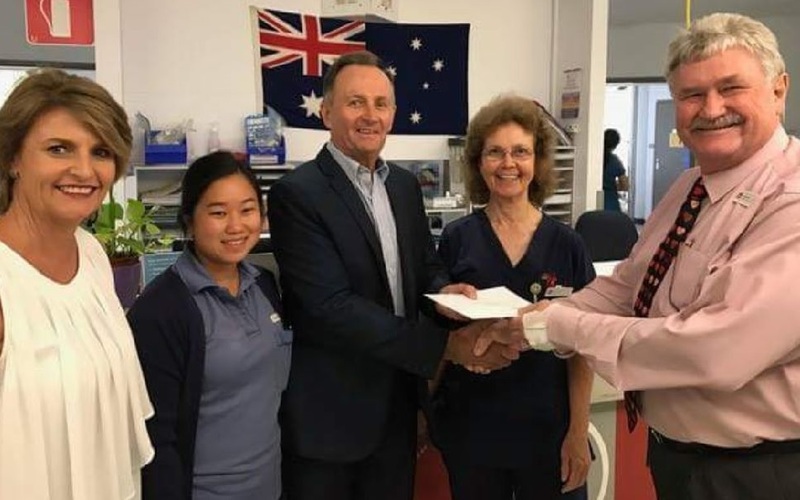 Pictured is Arnold Tammekand, General Manager of Fairfield Hospital (right), with ward staff receiving the donation from Thor Australia's MD, Mark Jamieson (centre) and Office Manager Julie Hagan (left). The donation adheres to Thor's policy worldwide of contributing to the communities in which we operate by supporting specially selected projects aimed at improving the lives of those in the the local area. Thor Oz wins Supplier of the Year - again! The Thor team in Australia was again delighted to have featured in the Dulux Group 2017 Supplier of the Year Awards function. 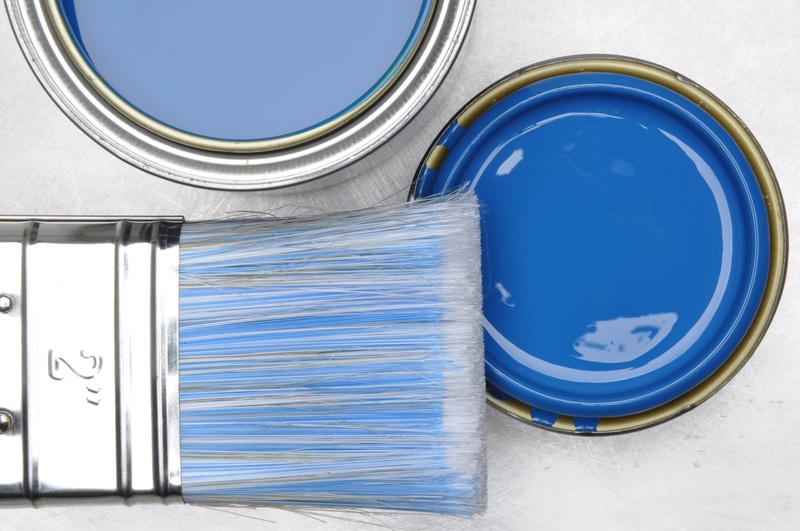 Dulux is the largest decorative paint producer in Australia and in 2018 will celebrate 100 years of paint production in Australia. 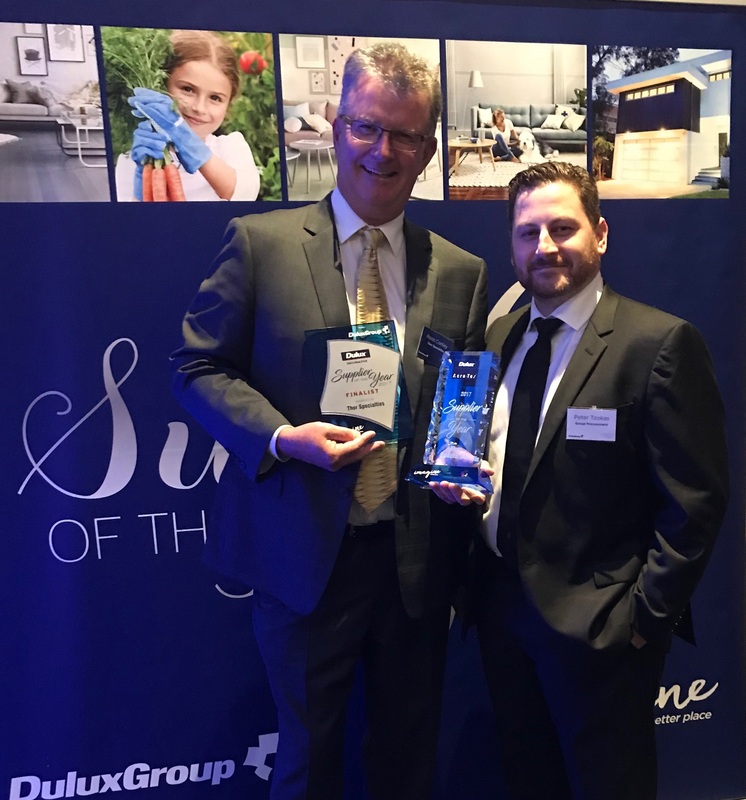 During the Awards Night held in Melbourne recently, Thor Australia's Area Manager for Southern Australia, Ross Conley, accepted the award on behalf of Thor Specialties, for the second year running, as best supplier to Acratex, the textured coating division of Dulux. The company was also a finalist for Supplier of the Year to Dulux Decorative Paints. Pictured is Ross receiving the award from Peter Tzokas, Dulux Group Procurement Specialist for raw materials. Thor Australia MD, Mark Jamieson, congratulated all staff at Thor Australia and acknowledged the huge efforts made by all to achieve this accolade.